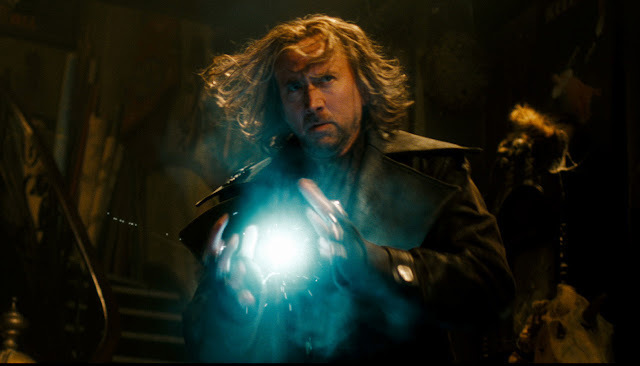 Nicolas Cage: This is a story about a lone wizard, Balthazar Blake, my character, who has been looking for 1,000 years to find the prime Merlinian, the one sorcerer who will inherit Merlin’s power and save the world. Jay Baruchel plays Dave Stutler, who is possibly the prime Merlinian because he’s the only one that can wear the dragon ring. Once Balthazar finds Dave he must groom and train him for his battle against evil. Q: Where did you get the idea for the film? 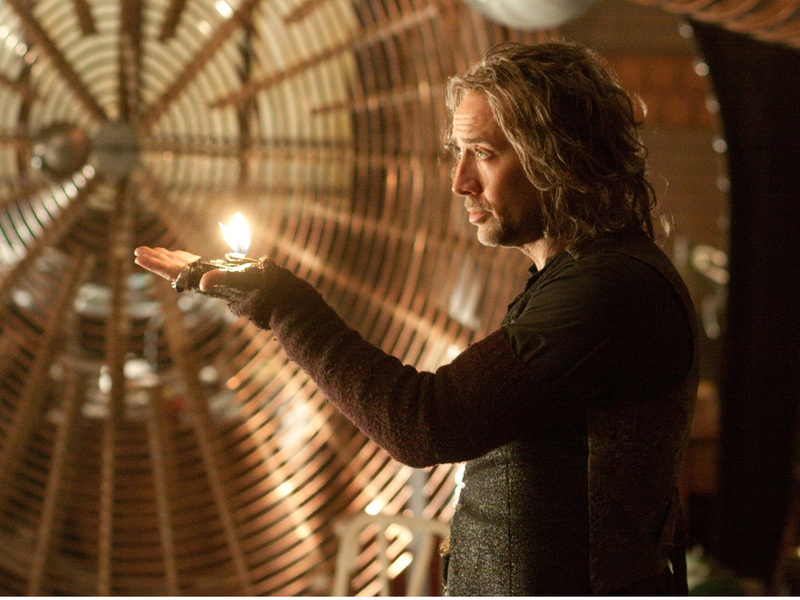 Cage: I had been very interested in the mythology of King Arthur—the legend and lore. And it occurred to me that I wanted to make movies that could resonate that in some way; that would be healing and positive. I wanted to see if I could use magic and the imagination to entertain audiences without facilitating bloodlust and having to resort to violence. At the same time I was doing a picture called “Next” and I was playing a magician of sorts in that movie but I really wanted to play a wizard or sorcerer. Todd Garner was the producer on “Next” and I told him about my idea. Todd said, “I've got it. You should be the Sorcerer's Apprentice from ‘Fantasia.’” Just like that. [SNAPS FINGERS] I thought that's great. So we started to expand the story and find ways we could lengthen this little eight-minute segment from the Goethe poem in “Fantasia” and make a big two-hour, live-action film. Cage: I was very young when I first saw “Fantasia.” I think it may have even been the first movie that my parents took me to see, so it was my first introduction to movies. It was also my first introduction to Disney animation and also my introduction to classical music. The imagery throughout the whole film, not just the Sorcerer’s Apprentice sequence, but the whole film transported me. It influenced my life and everything about it inspired me. I still watch “Fantasia” once a year. I lower the lights, put the movie on and I just sort of lose myself in it. I go into those animated forests and see the little fireflies and mushrooms dancing and it’s just a trip. [LAUGHS] I can’t help but love it. Cage: Some people have asked me if I was nervous because we were tampering with a Disney classic. I wasn’t. We made a film I think Walt would approve of and I believe that I was in the right place at the right time to make this movie in my life and to make it in such a way where I have faith in it. I don’t really have any expectations other than that I hope to make some children smile. That’s the best way I can apply my abilities as an actor. Cage: The relationship between Balthazar and Dave is almost like a paternal one. I care about him because I’m out there all on my own trying to stop evil forces from taking over. So when I find him, it’s with great affection and it’s an enormous relief because I have found the prime Merlinian. I want to guide him; I want to instruct him and train him for a larger purpose. But it is very overwhelming for Dave and he doesn’t quite know how to take it. Imagine if someone walked into your life and said that you are the descendent of Merlin, you have all this power and you are destined to save the world. You are going to tell the guy that he is nuts. So it is a very complicated relationship, but there is a lot of comedy coming out of it particularly as Dave begins to deal with this completely preposterous information. Cage: This is my seventh movie with Jerry, so we have a comfort level together. He has his process and he understands my sort of algebraic addition to the process—the X factor, if you will. I trust that Jerry will make movies that will be entertaining for people because that is his priority. And he trusts that I will come up with the X-factor that will somehow make sense of it all in terms of the character and will fit within the narrative. I think that's why he hires actors with an alternative point of view, because it does add an extra dimension to his formula. So it is a happy marriage where there is a shorthand. I know how he works and vice versa. Cage: Jon is very good with comedy and he knows how to get humor out of a scene. I have an interest in the darker and more edgy things, so Jon looks to me to go into more of the mystical aspect of the character and I look to him to help bring in more of the comedy that can connect with audiences. So it's a good mix and we balance each other out.